The Rudolfinum is the second most significant Neo-Renaissance structure in Prague, and is set in a commanding position alongside the Vltava River in the Old Town. The Rudolfinum was constructed in 1876-1884. Historically, it played an important role in the development of the newly formed state of Czechoslovakia in the early 20th century; the state parliament was sited here between the two world wars. 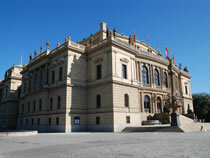 Today, the Rudolfinum is the seat of the Czech Philhar­mo­nic Orchestra, who arrange and perform classical concerts here. The Dvořák Hall inside the Rudolfinum is one of the two largest concert halls in Prague (the other is the Smetana Hall at Municipal House). The grandeur of the building make it an impressive concert venue. Unfortunately, many concerts held in the Dvořák Hall are effectively closed to tourists, with tickets sold only to subscription members, mainly Czech people, who sign up for a season long series of concerts. Where concerts are open to the general public they appear in our concert listings, for example the 'Dvořák's Prague Festival', which is held in September, as well as one off concerts by the Czech Philharmonic and other orchestras. There is a second concert hall at Rudolfinum, Suk Hall, for which all performances are open to the public. For listings and to book tickets for concerts at the Rudolfinum: Prague concerts.